What do countries trade, and why? To answer this question, standard analysis relates export product mix to comparative advantage arising from (Heckscher-Ohlin) differences in factor endowments and/or (Ricardian) differences in technology. For example, Hanson (2012) argued that past trade specialisation followed perceived patterns of comparative advantage. Low-income countries have positive (net) exports in resource- or labour-intensive goods, and high-income countries have positive (net) exports in (human and physical) capital-intensive goods. Yet in today’s world, products can no longer be characterised and classified by their factor content as production processes are internationally fragmented. For example, a smartphone exported from Sweden is likely to contain more domestic human (and physical) capital than a smartphone exported by Vietnam. This depends on the type of activities the countries carry out in global production networks. More R&D in Sweden and more fabrication in Vietnam. Baldwin and Evenett (2015) conclude that standard comparative advantage analysis might still work but needs to be applied at the level of activities rather than products. Unfortunately, we are lacking statistics on trade in activities. Hummels et al. (2001) and Johnson and Noguera (2012) laid the foundation for a new generation of trade statistics that track the amount of domestic value that is added in a country’s export. They showed that this share was declining in almost all countries over the past four decades, generally referred to as vertical specialisation in trade. These so-called value-added trade statistics have become part of the standard tool kit for analysts, available, for example, through the OECD/WTO trade-in-value-added initiative. Yet these statistics only capture part of the new trade reality as they are silent on the nature of the activities that are performed. In a recent paper we propose a new set of statistics that track the set of activities a country performs in its exports, which we refer to as ‘functions’. In a recent paper, we reveal a strong pattern of functional specialisation in the world economy (Timmer et al. 2018). We propose a novel index of functional specialisation akin to the revealed comparative advantage (RCA) index of Balassa (1965). It is defined as the ratio of the share of a particular function in a country’s exports and the same share for all countries’ exports. If the ratio is above one, the country is said to be specialised in that function. The shares are measured by the income of domestic workers that carry out this function based on their occupation (following an older literature such as Wolff 2003). We distinguish between fabrication, R&D, marketing and management functions. These groups are relevant as they differ in their demand for factor inputs as well as in their propensity to be relocated. They are also likely to differ in their potential for productivity growth and in the generation of knowledge and other spillovers. To measure it, we collected administrative data on occupational employment and wages for 35 industries in 40 countries. This information is harmonised with information on inter-industry and inter-country flows of goods and services as recorded in the World Input-Output Database (WIOD) (Timmer et al. 2015). Data and programs are free and publicly available at www.wiod.org/gvc_joeg and subsequent work is encouraged. Using our new measure, we find a continuous deepening of functional specialisation in the world economy. Figure 1 shows the evolution of the functional specialisation index for the period 1999-2011 based on aggregated exports from a set of 21 advanced countries in the world. We find that advanced economies continued to specialise in headquarter activities (R&D, management and marketing), while de-specialising in fabrication activities. 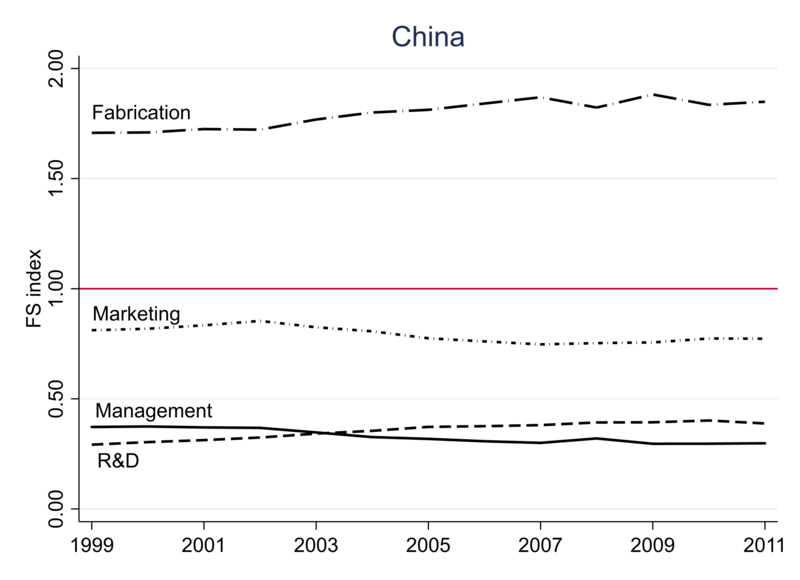 In contrast, China had a strong specialisation in fabrication activities. 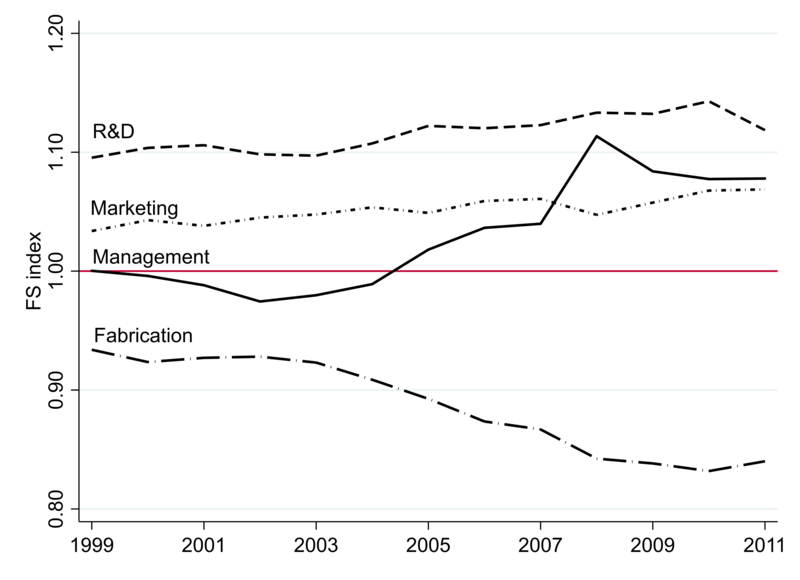 Its functional specialisation index for fabrication was already high in 1999, increased even somewhat further after 2001 when it joined the WTO, and levelled off after 2007 (see Figure 2). The patterns found for aggregate exports where confirmed in tests for bilateral export flows, following the suggestion of French (2017). By 2011 a pattern of deep specialisation in the world economy was established with headquarter activities mainly in Europe, the US and East Asia, and fabrication activities concentrated in China and a limited number of other emerging economies. Our second finding is large heterogeneity in specialisation patterns across countries at similar levels of income. This is suggestive of idiosyncratic factors that determine the local development of functional specialisation beyond general endowments such as human capital, infrastructure and well-functioning juridical systems. In 2011 most advanced economies have a clear comparative advantage in R&D activities, in particular Taiwan, France, Finland and Germany (see Figure 3). The correlation between GDP per capita and functional specialisation in R&D is high and positive (Pearson correlation of 0.63). This pattern is much less clear for the other headquarter activities though. 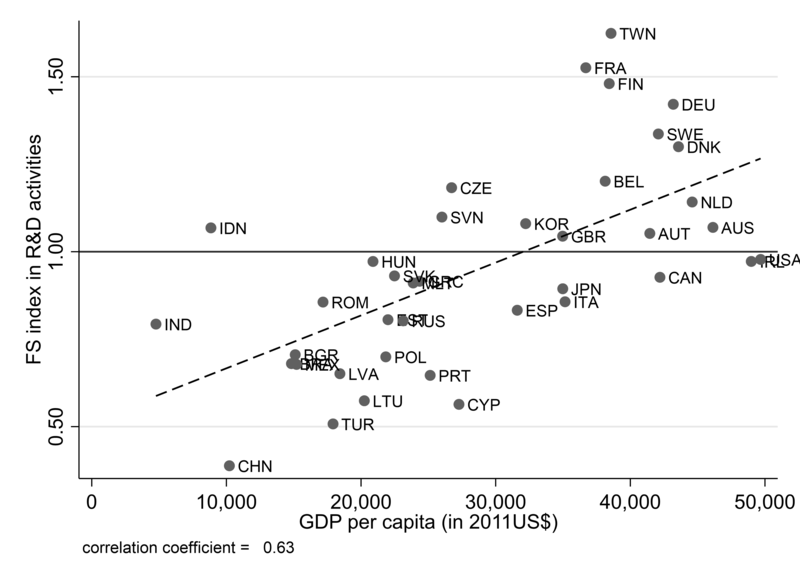 Correlation with GDP per capita is positive, but much weaker for marketing (0.13) and management (0.30). Some countries – including Belgium, Ireland, the Netherlands, Spain and the US – have a comparative advantage in both activities. Other countries – like Austria, Canada, Denmark, Japan, Italy, South Korea and Sweden – are specialised in marketing activities, but not in management. In contrast Finland, France and the UK are clearly specialised in management activities, but not in marketing. We also found that countries’ specialisation patterns are generally pervasive and change only slowly over time. Nevertheless, some smaller countries in Eastern Europe such as the Czech Republic, Latvia and Slovenia have managed to shift comparative advantage away from fabrication activities. We also provide novel evidence on functional specialisation within China using new information collected by Chen et al. (2018). Provinces can contribute to Chinese exports through exporting internationally themselves, or through delivering intermediates to other provinces that subsequently export. The functional specialisation indices are suggestive of a regional division of labour within China with coastal regions orchestrating production networks that reach deep into the inland regions, mirroring the global division of labour documented above. Large urban regions are heavily specialised in headquarter activities with Beijing focusing more on R&D, Shanghai most specialised in marketing and Guangdong on management. Most of the other provinces, like Shandong, are specialised in fabrication activities. Taken together these findings are suggestive of a deep international division of labour in the global economy with headquarter activities mainly in Europe, the US and East Asia, and fabrication activities concentrated in particular regions within China, and a limited number of other emerging economies. Further research and (regional) data are needed to uncover comparable patterns in other (subnational) regions. We believe that further investigation into the causes and consequences of functional specialisation will help us in better understanding the prospects of countries’ welfare in a (dis)integrating world economy. Balassa, B (1965), “Trade Liberalisation and ‘Revealed’ Comparative Advantage”, The Manchester School 33: 99-123. Baldwin, R E and S J Evenett (2015), “Value Creation and Trade In 21st Century Manufacturing”, Journal of Regional Science 55: 31-50. Chen, Q, Y Gao, J Pei, G J de Vries and F Wang (2018), “Formerly Assembled, But Now Designed in China? Assessing the Domestic Value-Added of Activities in Gross Exports”, Research memorandum 180, Groningen Growth and Development Centre. French, S (2017), “Revealed comparative advantage: what is it good for?”, Journal of International Economics 106: 83-103. Hanson, G H (2012), “The Rise of Middle Kingdoms: Emerging Economies in Global Trade”, Journal of Economic Perspectives 26: 41-64. Hummels, D, J Ishii and K-M Yi (2001), “The nature and growth of vertical specialization in world trade”, Journal of International Economics 54: 75–96. Johnson, R C and G Noguera (2012), “Accounting for intermediates: Production sharing and trade in value added”, Journal of International Economics 86: 224-236. Timmer, M P, E Dietzenbacher, B Los, R Stehrer and G J de Vries (2015), “An Illustrated User Guide to the World Input-Output Database: the Case of Global Automotive Production”, Review of International Economics 23: 575-605. Timmer, M P, S Miroudot and G J de Vries (2018), “Functional Specialization in Trade”, Journal of Economic Geography, published online. Wolff, E (2003), “Skills and changing comparative advantage”, Review of Economics and Statistics 85: 77-93.